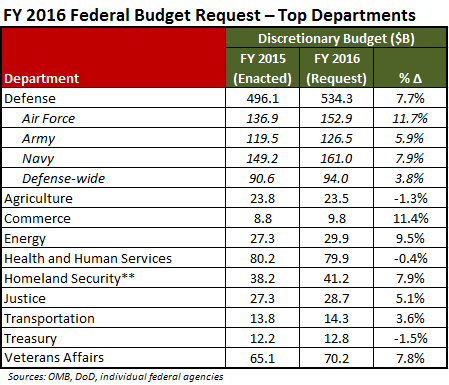 While the FY 2016 federal budget appropriations bills are working their way through Congress, the Office of Management and Budget (OMB) is looking to FY 2017 and has again directed agencies to submit lower discretionary budgets. Following their normal budget process and timelines, federal agencies are beginning to prepare their FY 2017 budgets, which will not be submitted to Congress until February 2016 to take effect that October, more than 16 months from now. As is customary for this time of year, OMB issued a memo with specific budget preparation guidance for FY 2017 to outline any new or specific parameters that agencies are to follow. The 5 percent reduction is to apply equally to defense and non-defense programs. Agencies that are split between the two may not reduce one area more than 5 percent to offset the other area. Identifying additional investments in programs that support their missions, especially programs with strong evidence of effectiveness. However, the agency’s total net discretionary for FY 2017 may not exceed the FY 2017 total provided in the FY 2016 budget request. Agencies should separately identify and rank these investments by priority. Implementing the DATA Act and FITARA. Further, OMB wants agencies to prioritize institutionalizing the use of data and evidence to drive better decision-making and achieve greater impact at their agencies. While there are no surprises or major changes in how OMB is directing agencies to develop their budgets over recent years, it seems that the number and complexity of requirements continues to grow. As spring progresses, news from most states is centered on legislative actions (some controversial) passed before the annual sine die adjournment of the state legislature. With that backdrop, many state legislatures will approve budgets for the coming fiscal year or biennium. Beyond the headlines about the growth of government and funding cuts to pet projects, or the spin promulgated by lawmakers’ press releases and governor budget addresses, vendors can find essential information on state priorities. A state’s budget and how it passed into law is important information for a vendor to have when deciding in which states or localities to compete for business. For most states, the budget process follows the same approval path by the full legislature and the governor’s signature. The first step in this process generally comes from the state agencies themselves. In most cases, these agencies report to the governor as part of the executive branch. The agencies conduct their own planning and budgeting process and submit a request to the governor’s budget team or office. The governor and his or her team then decide which priorities and funding to include and compile a document of the governor’s recommendations for submittal to the state legislature. At Deltek, we spend quite a bit of time compiling and analyzing the state governors’ recommended budgets. The budgets, along with other compiled data, are contained in Deltek’s State Government Profiles. The profiles provide essential and in-depth reference and research on state budgets, procurement, and organizational details to assist contractors in building important state buyer relationships and quickly ramping up new government sales professionals. A governor’s proposed budget is by no means the final budget that makes it out of a state legislature, though it provides valuable insight about the executive priorities and the fiscal condition of the state. These documents also provide us with historical expenditure data, which allows for a more in-depth analysis of budget trends and fiscal realities. Following the governor’s lead, the state legislature begins work on their own version of the budget. Sometimes they use the governor’s recommendations as a starting point, but this is not always the case in adversarial political environments. Both houses of the legislature (for every state but Nebraska) weigh in on the budget as it goes through the normal process of committee and floor votes, and then conference committees work to reconcile any differences. The legislature submits the budget to the governor and he or she decides to approve it or not. For vendors, both the governor’s proposed budget and the final version are important documents. They can help to understand both the priorities of an administration and the reality of the political system and/or fiscal climate. Of course, they also offer insight into exactly where state funding is flowing and which departments will be looking for vendor support. In the coming months, look for the compilation of state budget data, including IT line items and detailed Deltek analysis of this data. In addition, vendors in the architecture, engineering and construction (AEC) space should watch for more budget data specific to state investment in AEC as outlined in state capital budgets. You can learn more about state budgets in Deltek’s State Government Profiles. Not a Deltek subscriber? Click here to learn more about Deltek's GovWin IQ service and gain access to a free trial. The House and Senate both passed versions of a FY 2016 budget last week prior to their two week recess. The next step is to iron out their differences in conference and develop a budget resolution, which is supposed to be passed by April 15th, but rarely meets that deadline. Both the House and Senate versions of the budget are markedly more conservative than the budget request put forth by the president in February. The president’s budget provides an additional $37B for domestic discretionary investment above Budget Control Act spending levels in FY 2016, and $178B more than current law over 10 years. The House and Senate versions maintain current cuts to domestic programs under the Budget Control Act. The House version proposes cutting non-defense discretionary spending by an additional $759 billion over 10 years, while the Senate version proposes $236B in cuts over the same time period. Both House and Senate proposals would provide $96B in total war funding in FY 2016, through the Overseas Contingency Operations fund. The Senate budget cuts $5.1T in spending over the next decade, while the House budget cuts $5.5T over the same time period. The president’s budget request invests $478B over six years to create jobs in surface transportation repairs and includes $146B in FY 2016 for expansion of R&D tax credit to grow manufacturing and create jobs. Neither the House nor Senate proposals contain new funding for job creation. The president’s budget shows a deficit of $474B in FY 2016, but plans to achieve $1.8T in total deficit reduction over 10 years by increasing both spending and revenues. The Senate budget proposal runs a deficit of $343B next fiscal year and decreases spending $5.1T over 10 years. This proposal balances the budget in 10 years by cutting spending. The House version decreases spending by $5.5T over 10 years, balancing the budget in less than 10 years. The president’s budget exceeds sequestration caps for defense and non-defense spending in FY 2016 by over $70B. It proposes eliminating sequestration and spending $371B above sequester levels over 10 years. The House proposal adds $90B in war funding to prevent sequestration from affecting the military budget and proposes cutting non-defense discretionary spending by $759B below sequester levels over 10 years. The Senate proposal also adds to war funding in order to prevent sequestration from affecting the military budget and proposes cutting non-defense discretionary spending by $236B below sequester levels over 10 years. The president has indicated that he will not sign a budget bill that does not cancel sequestration cuts. With the vast differences between the White House budget and those proposed by Congress, it’s likely to be a long budget and appropriations process to get to something that the president will sign. Deltek's new report, FY 2016 Federal Budget Request: Challenges and Opportunities, indicates growth in federal contractor-addressable spending from $638 billion in FY 2015 to $660 billion in FY 2016. The FY 2016 $1.2 trillion discretionary budget request provides new, higher discretionary caps designed to replace sequestration limits set in the Budget Control Act. If passed as-is this budget proposal would offer some reversal of previous spending restrictions and infuse additional funds for both defense and civilian agencies. As a result, the budget reflects FY 2015-2016 increases for nearly every major agency. The budget request reintroduces the administration’s strategic priorities which include infrastructure, national defense, education, research and development, homeland security, public health (including veteran care), cybersecurity and cross-government customer services. The largest projected increase is seen in the area of equipment with a planned increase of 24% from FY 2015 to FY 2016, from $32B to $49B for contractor-addressable spending. The equipment category encompasses purchases of durable assets that normally may be expected to have a period of service of a year or more after being put into use such as transportation equipment; machinery; construction equipment; furniture and fixtures; tools and implements, instruments and apparatus; and information technology hardware. This category excludes aerospace and defense equipment. The aerospace and defense (A&D) market segment is expected to grow 5.8% over FY 2015 to $137B in contractor-addressable spending in FY 2016. The A&D segment includes full-scale development, production, and modifications of durable assets related to the aerospace and defense industries. The slight growth of A&D forecast for FY 2016 in the Navy and Air Force reflects a shift in U.S. defense strategy away from U.S. ground forces and toward naval and air power. Growth among civilian agencies is highest at Homeland Security/CBP, Justice/FBI, Commerce/NOAA, and NASA. Deltek’s analysis shows a nearly 3% increase from FY 2015 to FY 2016 in the contractor addressable portion of the federal information technology budget, growing from $101B to $104B. The IT budget shows a continued shift of dollars from Development, Modernization, and Enhancement (DME) to Operations & Maintenance (O&M). The budget also proposes $450M for initiatives such as Cross-Agency Priority (CAP) goals (e.g. shared services, strategic sourcing), funding for U.S. Digital Service teams at 25 agencies, and PortfolioStat. It also includes $14B for cybersecurity, including Continuous Diagnostics and Mitigation (CDM) and CyberStat program expansion. Although intact passage of the FY 2016 budget request is unlikely, it gives a glimpse at administrative and agency priorities which will remain in place even if requested funding levels are not attained during the appropriations process. Click here for more information on Deltek’s FY 2016 Federal Budget Request: Challenges and Opportunities report. Last week’s post took a look at Defense Working Capital Fund dollars that the Defense Information Systems Agency (DISA) anticipates Defense customers will spend with it in Fiscal Year 2016. 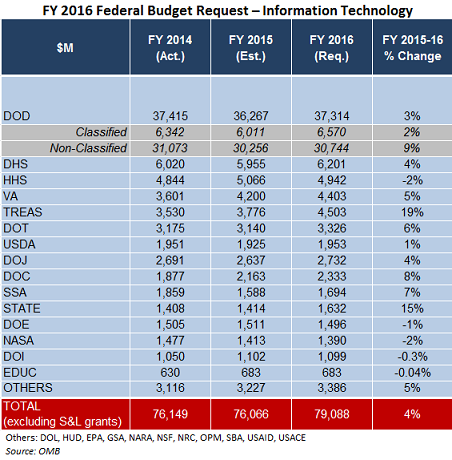 This week’s post examines the formal portions of the information technology budget that DISA anticipates it will have in FY 2016, including funding it has requested for operations and maintenance, procurement, and research, development, modernization, and enhancement. The programs on which DISA forecasts spending the most under each category in FY 2016 will also be examined. Not surprisingly, the highest number of forecast dollars can be found in DISA’s Revolving and Management Funds account. This account is where Defense Working Capital Fund spending is located, which is why it was the focus of last week’s post. This week’s focus is on spending in the other three categories, beginning with operations and maintenance. Breaking down O&M, we can see that not all of the programs receiving O&M funding are “programs,” per se. The White House Communications Agency (WHCA), for example, is part of the DISA organization. The Defense Information Systems Network (DISN) is where much work related to Joint Information Environment is taking place, primarily, but not exclusively, under the GIG Services Management –Operations (GSM-O) and GIG Services Management – Engineering, Transition, and Implementation (GSM-ETI) contracts. Spending on DoD mobility programs comes in at the far right of the spectrum, with $23 million in spending anticipated. Moving to procurement, we see that new dollars for tech refreshment and other acquisitions are going into the DISN, SATCOM, and other transport-network related programs. DISN investments focus primarily on the procurement of network switching (MPLS) and optical network equipment related to engineering the JIE. DISA anticipates spending $0 on DoD mobility procurement in FY 2016. This brings us to RDT&E funding, of which DISA has requested very little. There are no surprises here. The Joint Interoperability Test Command (JITC) receives most of the funding in this category. Some funding here goes to the DoD Mobility program for “tech insertion and the deployment of two Device Mobile Classified Capability (DMCC) gateways OCONUS which will include Top Secret (TS) and Secret capabilities in the Pacific and Southwest Asia.” Funding for the DISN will focus on the purchasing and testing of “optical and IP routers, switches, and Communications Security equipment” related to the upgrading of DISA’s optical network. In conclusion, this snapshot of the FY 2016 DISA budget shows that engineering the DISN to provide the backbone for the Joint Information Environment will remain DISA’s highest priority in FY 2016, with funding spread out in all categories of IT spending – O&M, Procurement, and RDT&E. DISA’s FY 2016 spending will remain heavy on communications and network equipment, with DISA personnel and service contractors already in place providing the support required to install and configure the equipment for the agency. On January 29, the American Association of Port Authorities (AAPA) held an event in Tampa Bay, Fla., on shifting international trade routes. One major topic of discussion was the need for more federal funding for the nation’s ports. The infrastructure at ports is reliant on funding to assist with improvements including security, equipment and general components such as roads and entrance facilities. While the majority of port traffic is goods imported into the United States, exports rely on a long line of infrastructure to move goods to those ports. Approximately 78 percent of all U.S.-made good are shipped via container. If port authorities receive more funding from the federal level, spending will inevitably increase at the local level. Farms, local factories and other consumer industries rely on ports to ship goods overseas, and if the infrastructure at ports around the country were capable of handling more goods and offering quicker shipping, industry may look to increase production. This chain reaction is a two-way street. Improvements to ports would be felt throughout the architecture, engineering and construction (AEC) industry, as local roads, bridges and other infrastructure will need to be capable of handling large trucks carrying shipping containers. Certain regions have roads designed for trucks, such as the New Jersey Turnpike, which provides access to the third largest port in the U.S. (Port of New York and New Jersey/Port Newark). In the other direction, transportation infrastructure across the country (not just in areas near one of the 149 major U.S. ports) is in dire need of improvements. If state transportation departments can move forward with improvements via federal funds, there will be greater access and safer routes to ports. Keep an eye out for future analysis on specific port authorities and construction spending as Deltek continues to expand reporting on the state and local AEC market. The graph below highlights construction expenditures within the Port Authority of New York and New Jersey (PANYNJ). While general construction topped $1.1 billion in 2014, spending has remained generally flat within the PANYNJ. Federal funding could provide the much-needed AEC boost to the nation’s ports. You can learn more about current procurement opportunities in the GovWin IQ State and Local Opportunities database. Not a Deltek subscriber? Click here to learn more about Deltek's GovWin IQ service and gain access to a free trial. While most federal departments received their final fiscal year (FY) 2015 appropriations in mid-December, the Department of Homeland Security (DHS) was put in a funding holding pattern by the last Congress. Now, the new 114th Congress is in session and the U.S. House of Representatives has moved forward on a funding bill for the department. In December, Congress passed an FY 2015 omnibus that funded all federal departments through the rest of the fiscal year, ending on September 30, except for DHS, which was funded with a continuing resolution (CR) until February 27, 2015. Now, with the DHS CR set to expire in a few weeks, the House has approved a FY 2015 Homeland Security Appropriations bill which would fund DHS through September, provided the Senate can move forward on a comparable version and the two chambers can reconcile a final bill to send to the president by the deadline. The House bill, H.R. 240, provides a total of $39.7 billion in discretionary funding, which is an increase of $400 million (+1%) over the FY 2014 enacted level of $39.3 billion, which itself was a billion dollars more than White House requested in the FY 2015 budget. If enacted, the $37.7 billion would constitute more than a 3.5% increase over what the president requested for this fiscal year. The bill and the accompanying Explanatory Statement provide details into agency funding and some specific IT investments areas. Office of the Chief Information Officer (OCIO) – $288.1 million, of which $189.1 million is multi-year money available through FY 2016. The $288.1 million is $31 million over the FY 2014 enacted level. An additional $1 million is provided for the DHS Data Framework initiative and an additional $500 thousand is provided for cyber remediation tools. Cybersecurity – The bill includes a total of $753.2 million for cybersecurity operations in the National Programs and Protection Directorate (NPPD). An additional $164.5 million is provided for NPPD Communications and $271 million for infrastructure protection programs, for an aggregate total of $1.19 billion. Cybersecurity workforce funding of $25.9 million is provided for Global Cybersecurity Management, of which at least $15.8 million is for cybersecurity education. Science and Technology – $1.1 billion, $116.3 million below the FY 2014 enacted level, but $32.1 million above the president’s request. This includes $973.9 million for Research, Development, Acquisition, and Operations. Customs and Border Protection (CBP) – $10.7 billion, an increase of $118.7 million above the FY 2014 enacted level. Of this, a total of $808.2 million is provided for Automation Modernization efforts for TECS, Automated Commercial Environment (ACE), International Trade Data System (ITDS) and others. The bill slates $382.5 million for Border Security Fencing, Infrastructure, and Technology (BSFIT). Transportation Security Administration (TSA) – $4.8 billion, a decrease of $94.3 million below the FY 2014 enacted level. Technology provisions include $334 million for Explosives Detection Systems (EDS) Procurement and Installation, of which $83.9 million is discretionary funds. The bill also includes $449 million for Transportation Security Support IT and $295 million for Screening Technology Maintenance. Coast Guard – $10 billion, $159 million below the FY 2014 level but $439.5 million above the president’s request, including $2.5 million to restore cuts to USCG information technology programs. Citizenship and Immigration Services (CIS) – $124.4 million in discretionary appropriations is provided for the E- Verify program. Federal Emergency Management Agency (FEMA) – $934.4 million for Salaries and Expenses, down $12.6 million from the FY 2014 enacted level. The bill allows for $7 billion for disaster relief and $2.5 billion in first responder grants, including $1.5 billion for state and local grants; $680 million for Assistance to Firefighter Grants, and $350 million for Emergency Management Performance Grants. Secret Service – $1.7 billion, an increase of $80.5 million above the fiscal year 2014 enacted level. This includes $21.5 million to begin preparation and training for presidential candidate nominee protection for the 2016 presidential election, including for protective vehicles and communications technology. It also includes $45,6 million for investments in Information Integration and Technology Transformation programs. As anticipated, the House bill restricts the use of funds for controversial White House immigration measures. The House Appropriations Committee Report that accompanies the bill includes an amendment stipulating that no funds, resources, or fees provided to DHS may be used to implement the immigration policy changes that the president initiated last fall. The ball is now in the hands of the Senate Appropriations Committee (SAC), which has just solidified and announced committee chairs after the leadership change resulting from last November’s election. The Homeland Security subcommittee will need to quickly move their bill forward from the last committee action last summer if they hope to make the February 17 deadline, so the clock is ticking.